Filtration surgery, also called trabeculectomy, is a treatment for several types of glaucoma including open-angle and narrow-angle glaucoma. It is often performed on patients who have not responded well to medication or laser treatment. 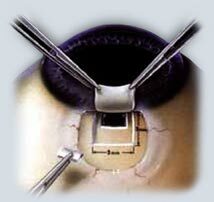 Filtration surgery usually provides a dramatic reduction in pressure within the eye. You will arrive at the hospital several hours prior to your procedure. Once you have been checked-in, you will be prepared for surgery. The area around your eyes will be cleaned and a sterile drape will be applied. You may be given a sedative to help you relax. Your eye will be numbed with topical or a local anesthesia. Using advanced microsurgical techniques and equipment, your doctor will create a tiny new channel between the inside of your eye and the outside of your eye. A small section of tissue will be removed, creating a channel, to allow fluid to pass through the blocked drainage network onto the white (sclera) of the eye. The incision will be closed with small stitches and covered with the thin outer tissue of the eye, called the conjunctiva. A small area under the conjunctiva will collect a pool of fluid called a bleb. Blood vessels in the conjunctiva will carry the draining fluid away. The success rate for this type of surgery is approximately 80 percent in cases where no surgery has been done on the eye before. However, everyone's eyes are unique and many people do require further treatments. In more difficult cases where even filtration surgery does not prevent damage to the ocular nerve, it may be necessary to perform other types of procedures. Serious complications with filtration surgery are extremely rare, but like any surgical procedure, it does have some risks.